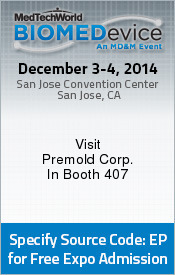 We are only about a week away for the BIOMEDevice trade show in San Jose December 3-4th, 2014. Regional manager, Lucas Boettcher and Engineer, Zeeshan Virk will be available to answer your questions. Bring along your concept drawings to discuss you geometry and challenges of your project. We will have prototype parts, high cosmetic parts, robust parts and medical carts on display. Visit with us at booth 407.